Rachael Ray’s legendary annual SXSW party just announced their RSVP along with their perennially powerful lineup featuring the omnipresent duo Macklemore & Ryan Lewis, The 1975, Frightened Rabbit, Delta Rae, ZZ Ward, Bob Schneider, and much more! Always one of the most sought-after parties, entry is on a first-come first-serve basis so get there early. Read on for the killer full lineup and RSVP link! 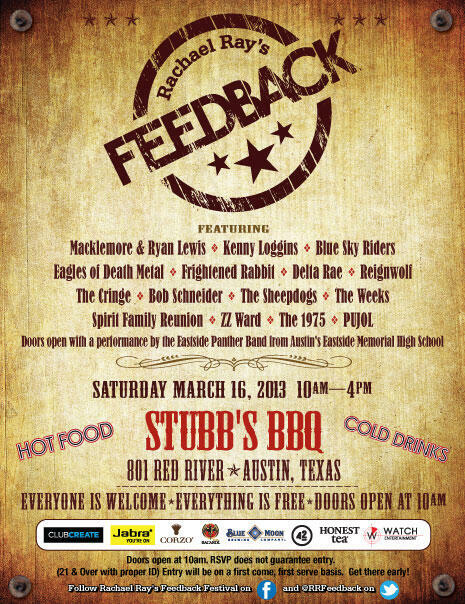 RSVP here for a chance to get in, but make sure to get there early as entry is subject to capacity – doors open with rock and roll performances from Austin high school bands so you’ll stay well entertained! UPDATE: Kenny Loggins and Blue Sky Riders have been added to the lineup!